Last night Jim and I both rounded a major corner in the jet-lag battle, getting a full-night’s sleep for the first time since we left Oregon six days ago. Since I can now sit for longer than five minutes without dozing off, I’ll journal more about our trip. Life without a head full of cotton is good. The rain has arrived, so Jim has departed for photo time about town, wet ambience and reflections from both the canals and the ground. While his camera reflects outside, I’ll reflect inside. Today is Halloween. Halloween in Venice is less about pumpkins and trick-or-treaters and candy, and more about All Saint’s Day and the arrival of thousands of Italians in town for the three-day holiday. There’s no sign of Halloween at (the late) American heiress Peggy Guggenheim‘s home, now a modern art museum. At Peggy’s bag-check, a young American intern asked me a question in a language-not-English. Later a pastry shop clerk called me Madame. I must appear international…until I open my mouth. I’m resting in our room at a small, modest, privately owned hotel, once part of a 16th century palace, about a ten-minute walk from the Rialto Bridge. Through our double window, I see peeling stucco, a bricked-in window, high cement walls, and twisted ironwork. Inside, the sage green décor screams Italianate, complete with canopied bed, a gaudy chandelier, a huge armoire with painted cherubs, 15-feet ceilings, padded wallpaper and a false window with drapery covering. (The fake window made me scream. I’d pulled back the drapes, exposing a mirror with a tall, blonde, cannoli-eating American staring back.) At home, all this would be at best, Disneyland tacky or at worst, ghetto scary. Here, it’s real, and utterly charming. The breakfast ladies bake the best croissants I’ve ever tasted. Each morning at exactly 7:10-7:15, the sweet scent seeps through our floorboards from the kitchen below. Our room has no alarm clock, but I’ve discovered a magnificent substitute. We’ve had less success with dinner food in Venice. I got bold and ordered something new for us (Jim always has me order for him because I speak Italian food so beautifully.) The locally-caught shrimp with polenta sounded like a good idea. Instead, we got brine shrimp atop a plate of mush. It tasted even worse than it looked. The fishy flavor spread though the polenta like nasty gossip. I think I know what the Grand Canal tastes like now. 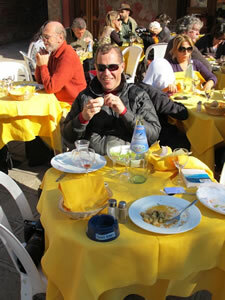 Jim says no more fish for him in Italy. An entire food group, wiped out, just like that. No more Saint Catherine for Jim, either, he says. I hoofed him to Zanipolo Basilica where Catherine’s foot (not her finger, as I thought earlier) stands in a case. (I hadn’t mentioned this pedestrian detail to Jim beforehand because I knew he’d take a stand against the foot.) In Siena Jim got scolded by a nun for photographing Catherine’s head. At Zanipolo, Jim got scolded by a priest for wearing a baseball cap. His chastisement occurred immediately after snapping a shot of Catherine’s foot. Jim believes Catherine’s out to get him. 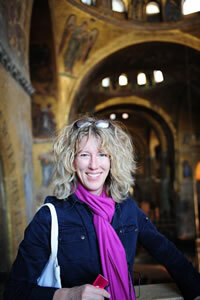 We toured many secondary sites like Zanipolo along with the major places like St. Mark’s and the Doge’s Palace. All terrific stuff, but I think one of our favorite memories will be of the kid-sized set of armor at the Doge‘s Palace. “Baby’s first armor,” our guide book read. “How soon they grow up.” Jim got the giggles. I caught them. We stood laughing while as people stared in Italian. We didn’t care. 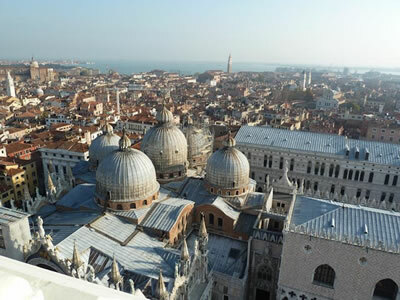 Each day we improve our Venetian navigational skills. I’ve learned not to fret over the hundreds of street names, but just follow general direction and landmarks. Our path from the Rialto to our hotel includes: Right at the tobacco shop, Right at the square with the gelato shop (after stopping for gelato) then up the little bridge, Left at the construction site ( I’m trusting they won’t complete construction while we’re here)… To find specific sites, I count waterways and bridges instead of streets. From the air we probably resemble mice scurrying through a giant puzzle. I feel like we’re living in one of those mazes kids do in elementary school. How to get from here to there without dead-ending or running into a canal? And instead of traffic jams, we have pedestrian jams. Jim especially loves the car-free pedestrian life-style. We’ve not encountered any cars, or any motorized ground vehicles, for that matter, for nearly a week. Instead, everything and everyone travels on boats. Besides walking, the Vaporetto water buses on the Grand Canal serve as our primary transpiration. 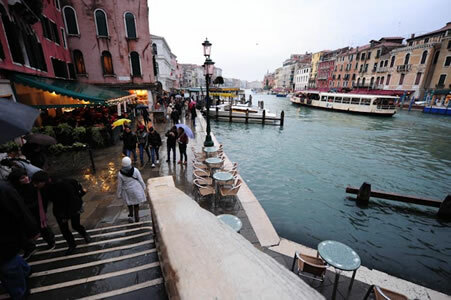 Between Vaporetto stops, we hop a Traghetto gondola to cross the Canal. 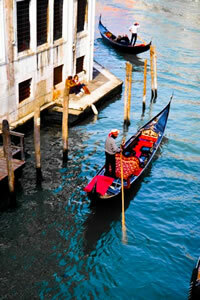 A standard tourist gondola ride costs about $140; we ride with the locals on a Traghetto for fifty cents. On the Traghetto, everyone stands, like a pack of George Washingtons crossing the Delaware. So far we’ve not fallen in. We’ve seen police and ambulance boats. Garbage and FedEx craft cruise the canals. We spotted a hearse boat transporting a gleaming wooden coffin across the lagoon to the cemetery island. Three undertakers accompanied the floral-draped box as the speedboat bounced and tilted on the waves. I presumed it was securely tied to the boat. 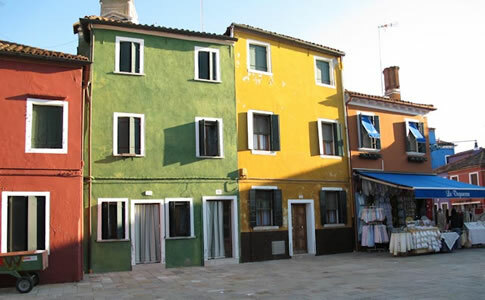 I could write more, about Casanova sites, Murano’s glass-making island, Burano’s lace-making island with its brightly painted houses. I just don’t want to over-do it, like I’m over-doing-it with all our sight-seeing. But I know Jim can handle it, except for Catherine--and now fish. 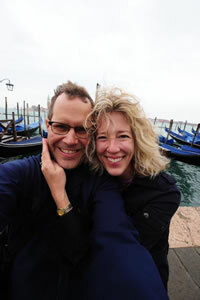 Yes, Venice is exhausting, stressful, crowded and confusing. And it’s magnificent, stunning, fascinating and captivating. We’re ready for some quieter days at the coast starting tomorrow. Just no seafood for us.